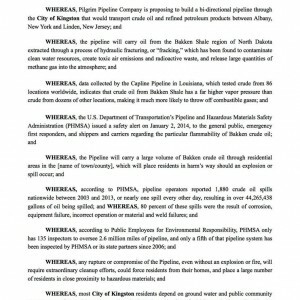 MAKING HISTORY: City of Kingston first city in New York State to Adopt Resolution to Oppose Pilgrim Pipeline. 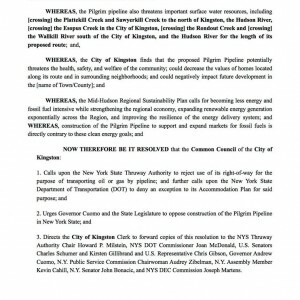 The City of Kingston Common Council unanimously passed a Resolution to Oppose Pilgrim Pipeline. Kingston is now the 8th municipality in the state of New York to take a stand against Pilgrim, joining 22 municipalities in New Jersey. Councilman Brad Will, who introduced the successful Resolution, said: “This unanimous resolution is consistent with Kingston’s Conservation Advisory Committee’s position. It protects the environment, residents, and business owners, and allows us to move towards a greener economy.” He credited Jen Metzger as the “dynamo” who warned him about Pilgrim. Will provided a map so the Kingston Common Council could see how directly it would threaten Kingston unless is it is stopped. Kingston is the first City in the state of New York to oppose Pilgrim, joining the towns of Rosendale and New Paltz, and the Village of New Paltz, which are also in the pipeline’s direct path. 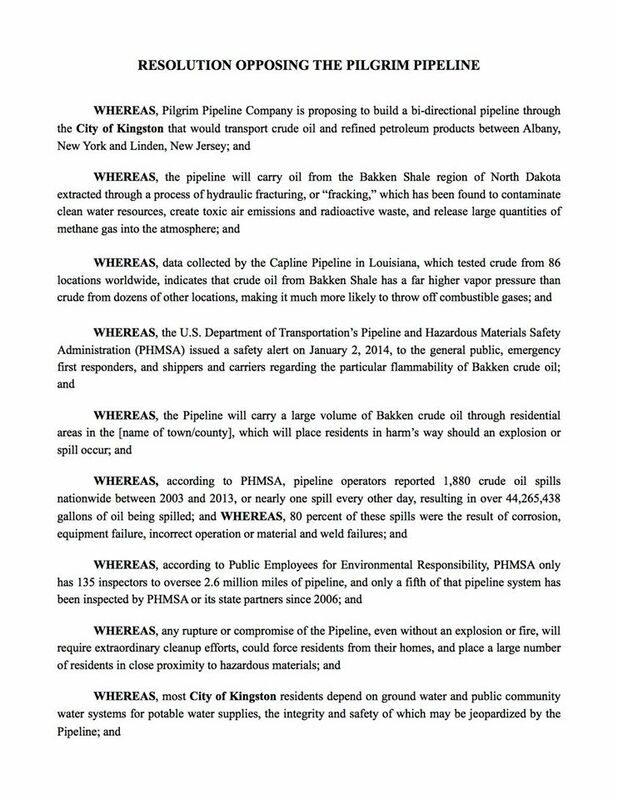 Rochester, Rhinebeck, Woodstock, and Marbletown have passed Supporting Resolutions Opposing Pilgrim Pipeline. The two-state total is now 30, a new milestone! Thanks for posting this. 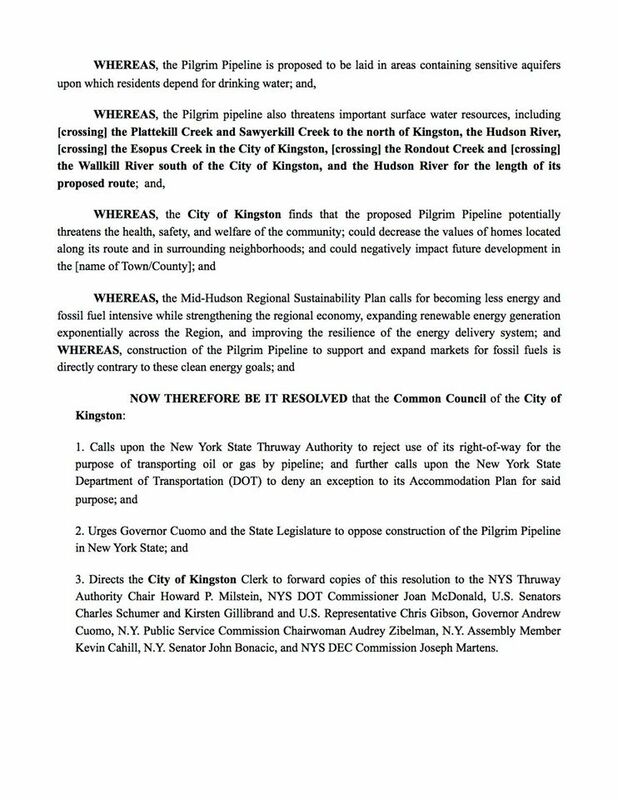 It was great to witness Kingston Common Council voting unanimously to pass the Resolution Opposing Pilgrim Pipeline. Now Plattekill has passed the 9th such Resolution in New York State! Could you please correct the spelling of “Pilgrim” in your headline here? It is Pilgrim, not Pilgram (Pilgram appears in the headline and in “Announcements: Pilgram Pipeline). Thanks!